Edgar Mason is ready to embark upon his new life at Agamemnon Frost’s side. But all is not perfect. His Martian overlord, Pandarus, has implanted a dark voice in his mind, a voice that urges betrayal. And though Mason can keep close to Frost, there’s little room for romance under the watchful gaze of the engineers from Station X. That changes when Mason and Frost reopen their investigation into their old enemy’s whereabouts. Posing as double agents and investigating cryptic rumors of “hollow ships,” they find him impersonating a London banker and worm their way into his confidence. But their success brings them trouble in spades. Pandarus takes them into the belly of his ships, where he plans to transfigure them into mindless automata. And with Earth on the brink of invasion, Frost’s old flame Theodora reappearing and Pandarus’s brainwashing growing more effective, Mason and Frost will find their bond tested as never before. 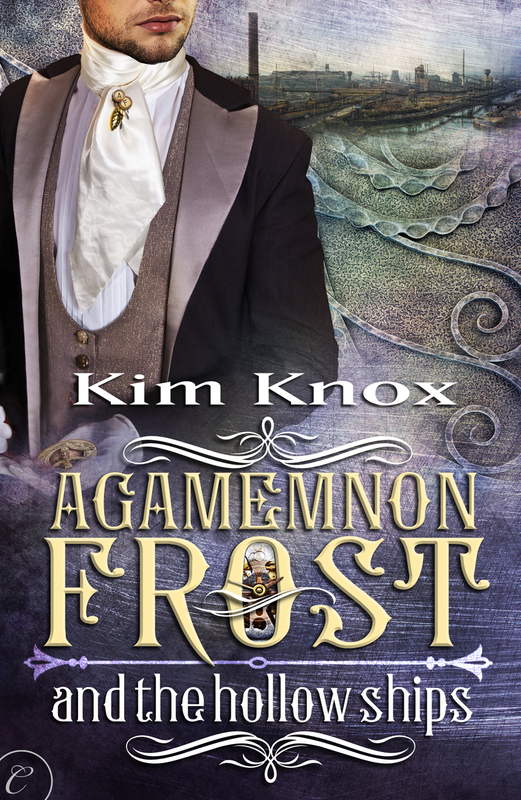 See how it all began in Agamemnon Frost and the House of Death. Mason moved to open the doors to the library and waited for Frost to precede him. The doors closed with a soft clunk on Nestor ordering Eurybates to rustle up coffee so thick he could stand his spoon in it. Mason ached to put his hand on Frost’s jaw, to stroke his skin and tease his fingers over his lips. The doubt of touching and being touched by him had faded almost to nothing. Frost might have dragged him into this insanity, but Mason had learned to accept his future. And wanted the future that included more than the tempting trace of Frost’s skin, the warm hint of sandalwood and vanilla. A pleasure shared. They’d snatched only a few heated kisses, and his need for Frost, for bare skin and fingers, mouths and dicks, always simmered, especially when they were alone. The clanking of the turning handle broke them apart and Mason’s thudding heart slowed. He scrubbed at the back of his neck, dislodging the itchy collar. Frost grinned at him, his beauty, even in the shadow of the passage and after a night without sleep, a wonder to Mason. Eurybates glanced at them, his eyes narrowing briefly before he scuttled away down the passage. Frost yawned, his hand covering his mouth. He shrugged at Mason’s lifted eyebrow. Two new releases this week!